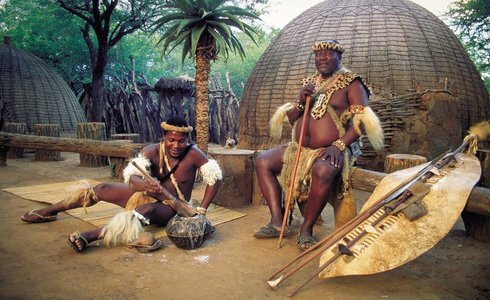 Experience the fascinating Zulu history and culture, through the telling of stories, tribal dancing, sangoma secrets and other traditional customs. Complete your Durban vacation and enjoy a Shakaland Nandi Day Tour Experience by entering the realm of Shaka - King of the Zulu tribe. Experience traditional Zulu culture and customs, and relive the excitement and romance of the days of the famous Zulu warrior -ensuring a memorable highlight on Your KwaZulu Natal holiday. Your tour begins as you are picked up from your Durban vacation accommodation and transferred in a luxury microbus or mini coach. Passing through sugar cane fields, Your journey takes you to Eshowe -the largest Zulu kraal in Zululand. Upon your arrival, you will be greeted by the sight of assegaai-wielding warriors, and experience the grace and energy of traditional Zulu dancers. Look into the future and discover the fascinating secrets of sangomas or traditional healers, and witness the artistry and skills of craftsmen and the community as they make spears, shields, beadwork and pots. Join in a beer making ceremony and sample some traditional beer, followed by a satisfying traditional lunchtime feast. Your Shakaland Day Tour Experience comes to an end as you are transferred back to your Durban vacation accommodation.